Since I use Stata daily and have to handle large amounts of data conducting elaborate statistical analyses I thought it would be useful to attend a course to learn about more sophisticated and effective ways of using Stata. My choice fell on the weeklong course named “Advanced Stata: Programming and other techniques to make your life easier” at the London School of Hygiene and Tropical Medicine (LSHTM). 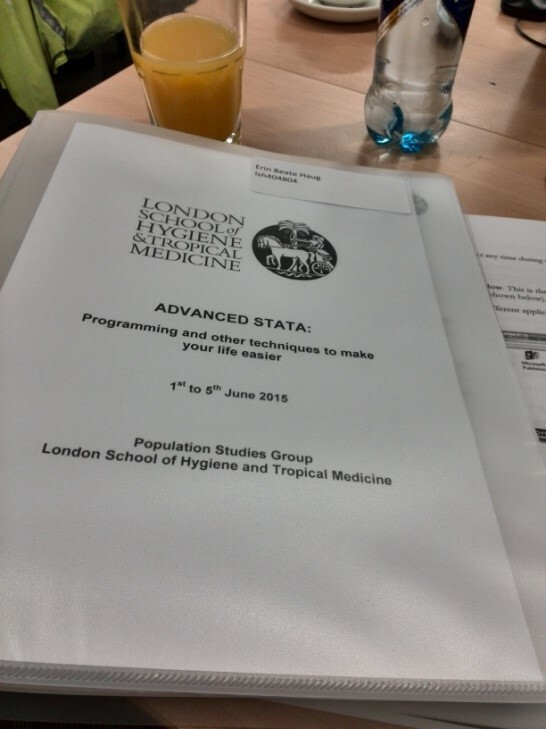 The reason for going to LSHTM was that I had done my master’s in medical statistics there and knew it to be a good place to learn. When arriving in London I was quite pleased to find the course very well organized with lectures followed by guided practicals where I got hands on training on the topics covered in the lectures. The instructors were knowledgeable, keen and engaging in their teaching and eager to share their expertise. There were also well placed breaks with drinks and snacks provided to ease the long days of learning. Another very valuable aspect of this course was the detailed course booklet (picture above) which contained the course curriculum. During the course I found that I learned several useful commands and ways of doing things in Stata that I did not know from before. What I learned I certainly found useful especially since the course made me able to effectively incorporate what I learned in my own work. The techniques taught are most suited for managing efficiently large amounts of data, data that is often updated and conducting extensive statistical analyses on such data. After the course I also realized that many things I thought only possible in a statistical package like R can also be done in Stata. I was very happy to learn how to write my own program and introduce more advanced functions and logical statements into my Stata code.